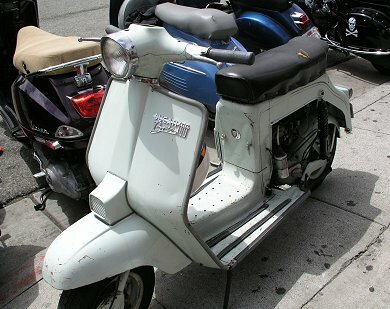 Scoot-Cati To Be Shown In Milan? Since Ducati pledged to show three new models a year we’ve gotten a flood of red-painted metal from Borgo Panigale; a new Superbike, new Monsters and the popular Hypermotard. Rumors are thick that this year, we’ll see a Multistrada replacement-armed with the four-valve, 150 hp 1098 powerplant-aimed at the BMW GS crowd and perhaps even a VMAX-like power cruiser. That alone would make the Ducati crowd happy, but what about the fast-expanding scooter market? Our man in the know, Italian designer Oberdan Bezzi, is convinced Ducati has something for them as well. He tells us that the latest news is that a prototype of a scooter (dubbed the “Scootster,” a contraction of “scooter” and “Monster”) will be unveiled at the 2009 Milan EICMA motorcycle show in early November. Oberdan thinks the motor will be an 850 and offer a multi-mode transmission like the Aprilia Mana. That’s not a bad assumption; I just had a conversation with a source at Piaggio, who told me Piaggio loves to sell powertrain units to anyone who’ll buy them. “Would they sell one without heads so Ducati could install Desmo heads,” I asked? “Sure” was the answer. Oberdan’s drawing shows the Testastretta motor’s deep sump, so maybe that’s not what he had in mind, but it’d make sense, no? He also envisioned an “S” version, with Öhlins suspension and maybe some lightweight 16-inch wheels as well. Oberdan and my mystery man at Piaggio think Ducati is working on a scooter, but I’m not so sure. Ducati has no need to expand the market for its bikes, as the factory is already near capacity. What Ducati wants is to strengthen its existing product line and build customer loyalty. A scooter, particularly something as big and expensive as this Scoot-strosity, makes no sense. But if it does happen, it won’t be Ducati’s first scooter; the factory sold a 100cc scoot, dubbed the “Brio,” in the early ’60s. I saw one at a scooter rally a few years ago, and I thought the Ducati logo on the legsheild was a joke. Not at all, said the owner, pointing out the “Ducati” logo on the engine case and VIN plate. He bought it cheap and got it running easily, and discovered it was actually a fun and reliable little machine. It was just the wrong product, introduced at the wrong time. Will history repeat itself? I just checked, and it is not April first. what a horrible idea. not a real italian style scooter and a big turnoff to any Ducati lover. 1. Great looking-design! They ought to at least build a number of working-prototypes for Ducati track days, or possibly as ‘trainers’ to help acclimate new motorcycle riders at the motorcycle training schools. 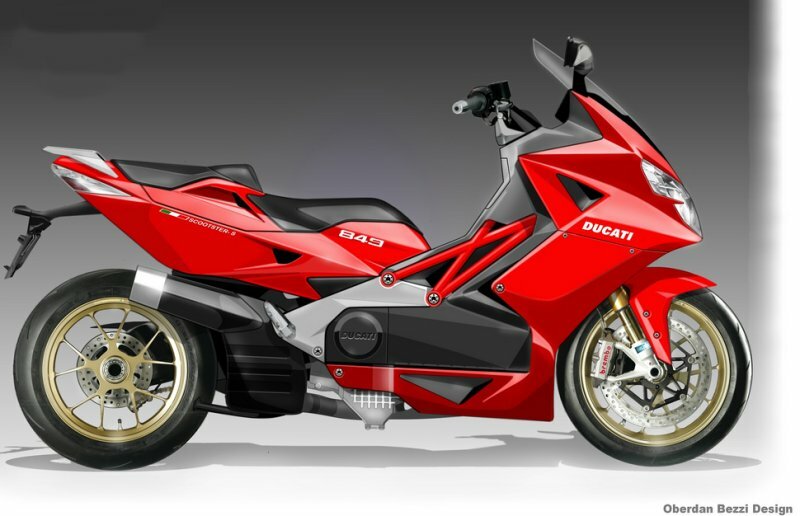 Can you think of a better Ducati sales tool to introduce newbies to the thrills of two-wheels? Then, move on to WSS: World SuperScooter racing! 2. I think lots of present day gear-shifting motorcyclists underestimate the greater foot & hand comfort of shiftless scooters, enhanced road-awareness safety, built-in storage convenience, plus many other features. For instance, scooters have centerstands: anybody who has returned to their M/C, only to find it toppled over on its left side from the kickstand sinking in the hot asphalt, or soft soil, knows the heartbreak & repair$$$ I am talking about. It wouldn’t be Ducati’s first automatic scooter!